This week, Stephen Ibaraki has an exclusive interview with Dr. Mathai Joseph. Education: B.Sc. (Physics, 1962), M.Sc. (Physics, 1964) at the University of Bombay; Post-Graduate Diploma in Electronics at Welsh College of Advanced Technology (1965), Cardiff; Ph.D. at the University of Cambridge, U.K. (1968). 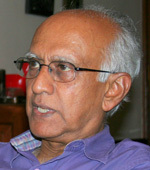 Academic: Fellow, Senior Research Scientist at Tata Institute of Fundamental Research, Mumbai (1968-1985); Professor of Computer Science at University of Warwick, U.K. (1985-1997). Visiting Appointments: Visiting Professor, Carnegie-Mellon University (1980-81); Visiting Professor, Eindhoven University of Technology, Netherlands (1990-92); Visiting Professor, University of Warwick (1997-98); Visiting Professor, University of York, U.K. (2001-2004). Industry: Executive Director at Tata Research Development and Design Centre, Pune and Executive Vice-President at Tata Consultancy Services (1997-2007). Other: Member-at-large ACM Council (2008-12); Founder member ACM India Council (2009-12). Author: Digital Republic India's Rise to IT Power, History and Memoir. This book analyses the rise of Indian computing. Interleaving history and memoir, it describes key moments and decisions which led to the slowdown in the 1960s and 1970s, and the changes in the 1980s that fuelled the ascent of the software industry to pre-eminence in what has become one of the world's most important industries. Along the way the author reflects on the nature of science, the importance of computing and the interplay of theory, experiment and technology. He discusses the wide differences in the academic perception of computing in India and the rest of the world and how it affected the growth of Indian computer science as well as the computing industry. "The first computer I saw was in 1963. It was the TIFRAC, built at the Tata Institute of Fundamental Research. I was studying for an M.Sc. in Physics with Electronics at the University of Bombay (now Mumbai) and a fellow student who worked at the TIFR invited two of us to see 'The Computer'. Getting into TIFR was easy: he had told us to nonchalantly get onto the TIFR bus at its first stop. The bus took us to the back of the building and we asked our way up to his office. He looked pleased, self-important and slightly embarrassed to have us in tow as we walked towards 'The Computer Hall'. I had expected to see something vastly complex but self-explicating, that announced its capabilities to those like us who enquired. And there would be scientists waiting to tell young postgraduates all we wanted to know about the computer. What we saw instead was a room full of open racks packed with circuit modules, wires hanging out here and there and a few people too busy to answer questions. 'You want to see computer? There it is', said one as he walked away urgently. I wanted to know more but there was not even a hint I could take away to think about. If he wasn't going to tell us about the computer, I needed to find out for myself...."
For more see http://www.stephenibaraki.com/cips/v109/mathai_joseph_profile.html for a list of Publications and a full BYWAYS profile. Opening Comment: Welcome today, to our interview series with outstanding professionals. I am Stephen Ibaraki, and I am conducting an exclusive interview with the eminent Dr. Mathai Joseph: Internationally Renowned Author, Executive, Researcher, and Technology Advisor; Distinguished Computer Scientist. Q: Mathai, thank you for sharing your considerable expertise, deep accumulated insights, and wisdom with our audience. (R)esponse: "Stephen, it's a pleasure to be talking to you again! You know, after our last conversation I started thinking about writing a book and that is now published. I'm not sure what will emerge after this conversation but it could well be something I am not expecting!" Q: You are a founder of the ACM India Council. How was this done and what value does ACM provide to business, industry, governments, education/academia, media, and society in India? R: "I was elected a member-at-large of the main ACM Council in 2008. At the time, ACM had a strong interest in setting up a new regional council in India as part of its plan for globalization, to widen ACM's areas of activity across the world. There was a great deal of support from ACM office bearers — the President Wendy Hall, the CEO John White and the COO Pat Ryan and the whole ACM Council — and the first task was to create an ACM body in India. A provisional ACM India Council was created in 2009 with leading figures from academic and industrial organizations and we went through the legal and financial steps to set up ACM India. As Treasurer, I worked closely with the co-Chairs, Anand Deshpande and PJ Narayanan, and the Secretary Srinivas Padmanabhuni and we patiently made our way through the formidable Indian bureaucracy to get all the necessary approvals! In 2012, we held the first ACM elections in India and a new elected ACM India Council took over in July 2012. This body now has the role of policy making for ACM India and setting up the executive framework. The great thing about ACM is that it is so widely known for its quality and standards that creating recognition was not difficult. Over the last two years, ACM professional chapters and student chapters have been set up all over India and new initiatives have been started in education, research and organizing conferences and meetings. A new ACM India dissertation award was instituted and the first awards have been made. Activities have started in improving computer science education in colleges and schools though, given the size of the country, there is an almost unlimited amount of work ahead of us. Unlike ACM in the US, most ACM India professional members are from companies and only about 30% are from academic institutions. Companies have been extremely generous in supporting ACM India, both for the annual ACM India event (which has a number of distinguished speakers, including Turing award laureates) and for specific programs." Q: Why should governments, corporations, universities and ICT professionals use ACM services such as the digital library, attend their conferences, join their Special Interest Groups (SIGS) and Chapter, read their publications, and make use of their learning center? R: "Two reasons: no-one disputes that ACM sets the gold standard for quality! ACM awards and publications are treated with respect everywhere. ACM also provides a framework for professionals and students to interact, have discussions, learn and teach. There is no other comparable body capable of doing all this." Q: We can learn a lot from your daily activities. What do you do every day, and what lessons can you share that will guide the audience in their careers and lives? R: "I am an e-mail junkie so the first thing I do each morning is to settle down with a mug of tea and read my Inbox in different accounts! I usually do this from about 6am to 7am by which time I feel I have caught up with events and people all over the world. After breakfast, I go to my room in the nearby TCS office and get started on the rest of the day's work: usually writing or reading reports, talking to people and occasionally attending meetings. As I have retired from operational roles, I try and keep the number of meetings down and concentrate more on nudging things forward, suggesting ways by which an activity can be hastened and talking to people who might be able to contribute. I try and help where possible by offering an opinion, reminding people of precedents and so on. In the late afternoon, I usually go to the gym for an hour or so. I have always found that rhythmic physical exercise helps to quiet my mind so it's great that it's also good for the body! More seriously, from time to time I try and train for the next 10 km race, which is as far as I have run. One day, I keep telling myself when I am out on an early morning run, one day I'll do the half-marathon and then who knows what! But I don't think too much about that. When I was writing my book, I worked on it at night when things were quiet. I read over what I had written the next day and tried to see how others may view the content. There was often research to be done on sources and facts and it was easier to do that in the day." Q: In each of your roles (past and current), describe three major challenges you faced and your solutions to the challenges that would be of value to businesses and ICT professionals? R: "The first challenge is building credibility, of persuading people that your views and opinions need to be listened to. Decision makers everywhere tend to work in small coteries and getting a new voice heard needs a lot of work. I worked outside India for many years and found that though it needs a great deal of effort to be heard if you're a relative outsider, after that things get done quickly. It's easier in India for me to be heard but it's also much harder to actually get things done! The second challenge is to form an alliance of people you can work with: a team, a group, a special interest group, or whatever. You can only get something worthwhile done if other people join you: a few may actually work for you in the same organization, but most others must have enough reason to join forces with you. The third challenge is to be as critical as possible of your own work. It is far, far better to know about a defect or limitation in what you have accomplished than to be told about it by someone else. Quite often, a shortcoming is an indication of where further work will be useful so being critical can help you find directions along which to move your work." Q: You recently authored a 'must-read' book. What prompted you to write this book? R: "The book was published just three months ago so I am not sure it's in the 'must-read' class yet! I wrote the book because I felt that the voice and views of people in science and technology are heard so little that usually all that non-specialists (i.e. most people!) have is a journalistic pastiche. Computing and IT have been atrociously misrepresented in India (and elsewhere) and we have allowed ourselves to be presented with another completely artificial voice. Yet computing has changed India more than any other technology. There are over 650 million cellphone connections and they have provided a route to democracy that no amount of legislation or political promise could have provided. And cellphone technology has succeeded precisely because of what can be accomplished by the computer inside: most Indians today hold in their hands more computational power than in the computer centres of the 1960s and 1970s. I feel it is as important that the nerd's words (!) are heard as it is to strip away the notion that we are all unthinking nerds. I have tried to relate my work with the rest of my life and with what was going on around me at the time. To take one example, at the time of the Bangladesh war of 1971, I was involved with some very demanding and critical project work. However, that war was not just a distraction from this work — it was something that occupied my mind and the minds of everyone around me so much that work had to take second place. How could I write about the work without also writing about the war?" Q: Can you overview the chapters in your book? R: "The book analyses the rise of Indian computing. I talk about the early days, the growth of computing as a science and how it relates to other sciences. Most of my work was experimental, where one had to build a system to evaluate how an innovation actually works. It's harder for people to accept that such work is also science. I tried to write the book for a general audience so the memoir does not have a detailed technical history. It is a personal account of the incredible explosion of an industry seen through the eyes of someone who was there from the beginning. Starting with college in Bombay in the early 1960's, the narrative moves to postgraduate work in Cardiff and Cambridge at the time when computing began to take form and its boundaries were better understood. We lived in a changing world: the explosive effervescence of pop music, fashion growing from both the fizz of Carnaby Street and the war surplus stalls in Portobello Road, literature moving past the existential pipe-dreams of the Beats. This was also the time when computer science began to take form. The next chapters are set at the Tata Institute of Fundamental Research (TIFR) where science was revered. Computing however was considered a bag of techniques suitable only for solving large numerical problems. Outside the TIFR, India had begun to confront the realities of computing, with opposition by trade unions countered by the relentless move of technology. Despite the odds, computer science was made to grow in that inhospitable soil and our research group won recognition among its worldwide peers. At the TIFR, the success was viewed with complete indifference: barriers put in place corralled computing within narrow boundaries and stifled further progress. So I reluctantly decided to move to the UK where I had been offered a chair in computer science. Going to the University of Warwick brought many changes, from the constraints in the India of the 1980's to the first flush of Thatcherite Britain, from the uncertainties of computing at the TIFR, to the strident demands of teaching and research in a challenging environment. The university administration sought total control over departments while the government played university against university in reducing unit costs and massively raising student numbers. In this demanding environment, one had to learn that while simple survival was possible, success needed hard-fought recognition for courses taught, work done and research money earned. Eventually, the draw of the homeland proved irresistible and my wife and I returned to India in 1997. I found a job at the research centre for Tata Consultancy Services in Pune and in 1999 I became Executive Director. Working for a company meant that the financial constraints of university research disappeared and the demand was for quick achievement. This period of furious growth of the Indian software industry raised accusations from within and without of incarcerating young people in a web of body-shopping and dull mindless work. In fact, it was the formative time of an enormously successful industry where research and development had to find a way to contribute to the work of fast-moving project teams." Q: Share a few unique and meaningful lessons from your book — lessons that will be hard to find elsewhere. R: "This is the first memoir by a computing person in India, one of the first by any Indian scientist. We tend not to tell our own stories yet it is vitally important for others to get a first-hand account of what things were like so that they can understand how we got to the present. We are not all single-minded nerds! Scientists have so many other interests that contribute to their work. Was I listening to Bach's Mass in B when I began to see how to solve that problem? Or was it John Coltrane? What was I thinking of when Auden recited from his new book? Why does the simplicity of the majestic lines of the cathedral at Chartres appeal to me more than the Bavarian Gothic of the churches in Munich? We tend to have higher standards for certainty and knowledge than in many other fields. We are less willing to embark on political, literary or artistic criticism than our counterparts in those fields are to venture with often grossly ignorant views about science. So perhaps there are some lessons to be learnt from scientists. Finally, science is no less important to the human condition than any other field. " Q: What value will the audience receive from the book? R: "I wrote the book largely to describe the life of a person who became a computer scientist before that term was invented. Surprisingly, most of the messages I have talk about the early part of this journey, the descriptions of college life in Bombay (as it was then) in the 1960's. Some are from people around my age, so perhaps there is nostalgia, but many are from people who were not born then. The first four chapters seem to have struck an unexpected chord. There has also been interest in the account of an Indian student in England at a time when there were far fewer Indians there than today. The descriptions of my early days in Cardiff and the later period in Cambridge seem to have fascinated a lot of people. A few have commented on my account of life as a research student. One said in his blog, "I found the section where he describes how his supervisor allowed him to find his own feet and interests, and yet guided him gently to enhance the rigour of his work, a wonderful lesson in socialization into the research process." I am pleased with that comment as I did want to convey the difficulties of starting to do research, an experience I went through and I have seen my research students go through. Many of the non-technical readers skipped the parts with descriptions of computing. I am a little disappointed because I had hoped I had simplified things to the point where they would be easy to understand! For the slightly more technical reader, the book also provides a history of the growth of computing in India, the slow early steps, the bureaucratic barriers and then what has amounted to being a rush of success. " Q: With your insight as a top executive, what are some of the future challenges for business executives in small and medium sized businesses and in enterprises? What are the solutions? R: "I was an executive vice-president of Tata Consultancy Services for about ten years only, so I can make no claims to a long career as a manager or executive. Like the whole Indian software industry, the company was changing enormously during those ten years. Even today, when analysts describe it as the bellwether of the industry, what is often ignored is its ability to change and adapt. Brick-and-mortar and smoke-stack industries require ten to fifteen years to change the nature of their business; software service companies have to transform themselves every two to three years if they are to survive. All work must contribute to this agility, from the way the projects are undertaken, to the kind of research and development that needs to be done (something of special interest to me). Tailoring R&D goals and processes to match the current and future demands of large software companies is still an evolving story; there are no major successes we can point at today but we are certainly getting better and better. Small companies tend to be based around a single idea or a single product. The successful ones will be absorbed by the heavyweights and the others will fade away — and remember nine of every ten new companies are not successful. The large companies have their own hierarchies and inertia which resist change. Few major innovations come from large companies because their willingness to take on risk is limited by their rigid processes. IBM had to create a completely new division in a new location to run their PC business because they saw how different it had to be from their established businesses of mainframe computers, discs and printers. Mid-sized companies fit somewhere in between and they have to grow if they have to meet market demands." Q: What future disruptive innovations should business executives be watching?? R: "I will give a few examples where I feel there will be major changes. First, the iPad showed us that most people don't want computers, they want well-engineered devices that help them to undertake useful tasks. I think computers will disappear into devices and make them far better tailored to human use than in the past. Already, PC sales are dropping and people are moving to tablets and tablet-like phones so the change has started. Second, large companies still have substantial IT divisions to develop and run their systems. It does not make sense for a bank to employ thousands of people for their IT systems when their business is managing money. After all, steel companies cannot survive without rail and sea links but they do not run freight railway networks and shipping companies. Why should an insurance company, an entertainment company or an airline have an IT division? The career prospects for people working there are so limited that there is a high staff turnover, even though salaries are above normal. The most compelling reason is usually that these companies need to bring new products to their customers with very short lead times. With the Cloud, I see a great deal of the computing and software infrastructure of an industry being standardized: the basic functions of a bank (or an insurance company, an airline) are identical to those of its competitors so there is no reason for these to have a proprietary design. Companies distinguish themselves by their products and I think software companies will build on the infrastructure and come with near-market-ready products that can be tailored to meet the specific needs of a customer within days. Third, when one company merges with or acquires another, auditors and accountants will carefully go through their books and assets to value the company. No-one bothers to value the software systems that virtually run the company, yet the operations of the company are as critically dependent on these systems as on physical plant and equipment. The emphasis in valuation has to move away from looking at static and physical assets to valuing transactions: what is the full end-to-end cost of selling a ton of steel or an airline seat? In which part of the software lifecycle are its systems and how soon will they need to be replaced?" Q: Tell us more about your vision and objectives behind your current roles? What do you hope to accomplish and how will you bring this about? R: "Most of my attention now is in education, where I spent a great deal of my career. In India, teaching is no longer a sought-out profession and we are woefully short of trained teachers in schools, colleges and universities. The big opportunity for us, and indeed for the whole world, is to be able to use the Internet to make good material available to students at all levels. It is going to need a great deal of experimentation to understand how best to combine online material with live teaching because teachers are always going to be the thought leaders and mentors of the education system. The requirements will vary from country to country: the Khan Academy has shown what can be done in Los Angeles schools but similar successes have not been reported from Pakistan, where Salman Khan came from. How does the model need to be adapted and changed, what sort of new material is needed? There are enough questions to keep us busy for some years and we will have to both make a start and share knowledge." Q: What are your insights and predictions for the Asia region? R: "I am a perpetual optimist so I may not always be realistic! I think in India we are on the brink of a major set of economic and social changes that will transform both urban and rural life. The resistance to these changes provides a good indication of how different the future will be. I don’t know if it will start in one year, or in several, but change will happen and lives will improve. I am sure this is true also for other countries in Asia and change may well start first in smaller countries. " Q: Mathai, with your demanding schedule, we are indeed fortunate to have you come in to do this interview. Thank you for sharing your substantial wisdom with our audience.